Good evening guys! First of all, let me thank you for taking the time to share some insight about the band with us. Let’s get straight to the point: who and what are MAJOR DENIAL? At the age of thirty three I started having classical guitar lessons, which lasted for about a year because I decided to get involved with the electric guitar. 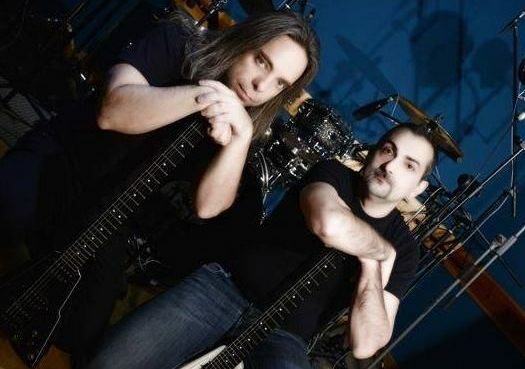 Panagiotis Haramis (bass) suggested Achilleas Diamantis as a tutor with whom they played together in a band called Confusion. I reckon that this was fatal as Achilleas Diamantis, apart from being my tutor, is a member of MAJOR DENIAL. He immediately realised that I do have musicality and a few years later we both started working on my ideas through the procession of music composition. I gave the name to this studio project and it simply means that I prefer minor ways in music. Last December  you released your first full-length album, “Duchess of Sufferings”, but before we dive into that, could you please give us a quick overview of your previous work(s), e.g. the “Minor Ways” EP? “Minor Ways”, was released on January 2015 and it was our first attempt. There were three different vocalists participating in it. Yannis Papadopoulos, Stratis Steele (ENDOMAIN) and Denny Anthony (SIGNS OF REIGN). Mark Zonder (WARLORD, ex-FATES WARNING) on the drums, was the special guest of the album. The EP was released as a special binyl edition in 525 hand numbered copies. You surely had some interesting guests appearing in that one [“Minor Ways”]. Mr. Zonder (FATES WARNING) was definitely one of them, along our very own fellow-Greek Yiannis Papadopoulos (BEAST IN BLACK, ex-WARDRUM). How did you ended up working with them? Yannis is behind the microphone on “Duchess Of Sufferings”. We worked with Stratis and Denny (both are great singers) because Yannis could not continue with the rest of the songs. We intended to record the new album with Yannis and this is why we did not continue with Stratis and Denny. Mark Zonder did great , but, we could not afford him and we wanted a more dynamic drummer. 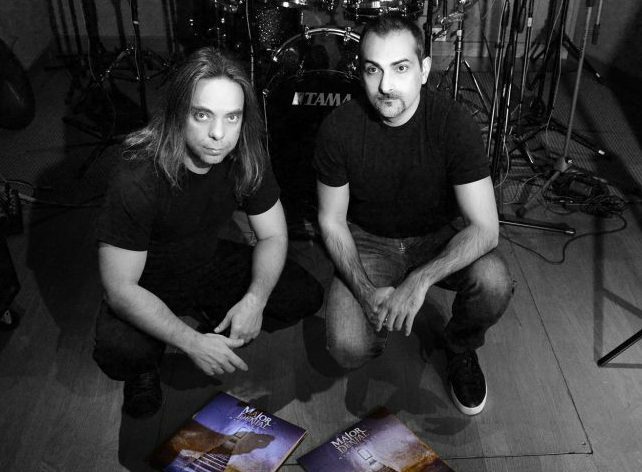 Kostas Milonas is a really talented drummer and he did great on the album. As a musician what do you seek from having a guest in your album? There surely is the attention you’ll probably get from the press, but what’s there regarding the music? When you are having a vey well-known musician as a guest, you will get attention from the press and the fans. There is an advantage, especially for a new musician and it can help to be listened to by a large number of people these days. It is not easy; everyday you can find out new releases and it is difficult to find a place in the music market. As far as the music is concerned, a musician like Mark Zonder can take you to a higher level, he can bring ideas, personality, style, it is not (only) about the name. As someone might expect, having a top-class guest musician contributing to your album could be rather costly. Supposedly you have an unlimited budget stream, which people would be your top picks and why? That’ s a great question for romantic people like me! Ok, let’ s start. VOCALS: Russell Allen. Simply, the BEST metal singer nowadays and with a style that fits my music. DRUMS: Mike Portnoy. Many choices, but I had to pick one. BASS: Sean Malone. Some of the best bass lines we ever listened to. LEAD GUITARS and VOCALS: Michael Akerfeldt. Surprise? Hmmm….beautiful phrasing, the best composer and the growls that could lead to a new way. Who would not pray to work with a genius? Let’s get into the “Duchess of Sufferings” stuff. Two years down the line and you get to release a new album. Would you like to share a few info about it? Who were the “core” contributors, who were the guests, how was it produced etc. “Duchess Of Sufferings” is our first full album. It is inspired by Clive Barker’s “Coldheart Canyon”. It is a purely melodic/prog metal concept. I wrote the music and the lyrics and Achilleas Diamantis did the programming and the arrangements. It includes ten songs lasting around fifty eight minutes. Artwork is by Nihil (Leprous). The guitars were recorded in two different studios, eight songs were recorder in Soundlab music productions and two of them in Subway studios. The drums were recorder in Bree studios and the vocals in 9800 studios. Lisette van den Berg’ s vocals, who is a special guest in one song, were recorded in Mass studios Utrecht. The recordings lasted for about three months, the production was made by us and mixing and mastering were made by Daniel Cardoso (ANATHEMA). A noticeable change compared to your previous release, is that you have narrowed down your “arsenal” when it comes to vocalists. Yiannis had the leading role behind the mic this time. Was that due to the needs of the album – from an artistic point of view – or was it just for making the process easier? When I was writing the music and the lyrics of the album, I was listening to Yannis’ s voice. I think most of the composers will understand me. He has a colour that I love. It is obviously an artistic point of view and definitely I was right because his performance is simply outstanding! How was the writing process for “Duchess of Sufferings” done like? Did you look for the guests first and then started working on new material, or was it the other way around? I wrote the music. Achilleas Diamantis did the programming and the arrangements, we worked also together on the structure of some songs and he brought many lead ideas. He also proposed Kostas Milonas for the drums. Yannis was the one, so, I looked for a female vocalist, the “Duchess Of Sufferings” (Lisette van den Berg). How does the writing process looks like in general? Who’s the “mastermind” behind MAJOR DENIAL’s music? I am behind the music and the lyrics of MAJOR DENIAL. I am not somebody that went into this magical music world at a young age. I started having lessons at the age of thirty three and I was lucky because my cousin, Panagiotis Haramis, our real talented bassist, helped me and suggested Achilleas Diamantis as a tutor. So, MAJOR DENIAL is basically a student’ s project, my project. I’m sure the “progressive metal” tag is the obvious choice when it comes to describing your music, but which bands/artists would you use as a reference for someone that hasn’t listened to your music before? I am not sure if my music can be used as a reference, but bands such as QUEENSRYCHE, FATES WARNING and the metal God, Tonny Iommi are responsible for some ideas of the album. Any bands/artists you discovered recently and might want to share with us? Doesn’t have to necessarily fall under the metal genre. Damnations Day, Witherfall and Hekz. You mention the theme of the album was based on Clive Barker’s “Coldheart Canyon”. However, looking at the lyrics, I don’t think we’re dealing with a conceptual album here. Would you like to elaborate on this? Clive Barker’s “Coldheart Canyon” inspired me in order to point out man’ s lust for glory, wealth, immortality, his choice to make everything to conquer them and to remain young and glorious unable to see behind superficiality. You can’t but abide by the rules of morale, with respect and modesty and hope that you will be unpunished. Duchess of sufferings lures and she will have the last word. Are there any thoughts for a fully conceptual sometime in the future? You know, something in the veins of a “rock opera”. Well, I see no other option if I continue. A more ambitious project, something that will make me read, think, dream and talk about it. It is the first comment like this, but maybe you are right. You listened to the album and read the lyrics for sure and thank you for it. Many people don’ t care about the lyrics, but I think they are a huge part of music, otherwise you can make just an instrumental album. On the one hand, as a music composer I am glad to hear that the music managed to capture the dark atmosphere but on the other hand, I have to try harder on the lyrics in the future. I’d like to focus a bit on the closing track of the album, “Se Ipse Necavit”, as it’s the only one with a second vocalist behind the mic, mrs Lisette van den Berg (SCARLET STORIES, AYREON). What is this track about and why did you choose Lisette to accompanies Yannis on vocals? Would consider doing an album solely based on female vocals at some point? I was looking for the Duchess.This was the concept, I wanted the Duchess to talk in the end and this is this track all about. I have chosen Lisette (although I had other suggestions) because she is simply one of the BEST female singers in the world. In my opinion, Lisette is an example of not a fair world. There are many more well-known female singers, but, Lisette is far better than them. Again, if I continue, Lisette is so great that would make me think of this option. If there’s anything you’d like to mention about “Duchess of Sufferings” please do so. I’d love to hear any trivia or funny stories about how it came together. I would like to tell a story about ‘’Se Ipse Necavit’’. It is the only song title that came before the music and it is not mine. There is someone that I love to chat with about philosophy, life and I respect him a lot. Charilaos Goutos, my wife’ s uncle and university professor. Last summer, on the mountains of Epirus, where we met, we had one of our conversations and he ended up with this latin words…I asked him the meaning of this and I just loved it. At the same moment I told him that this is going to be a song title of the album. I believe you’ve mentioned in the past that MAJOR DENIAL is a “project”, meaning your main focus is to record and perform only in the studio. Is this due to time/family restrictions or do you see it more as a side-activity? Major Denial is a studio project and not a band. Additionally, my time is really limited and so there are no plans of live shows. Are any plans to take it to the next level and turn to a full-time band? What would that take? Unfortunately not. Never say never, but I am aware of the situation. It would take a lot, a total change of my life and this is not what I want. I have a family and this is my life. What will be the next steps going forward? Are you currently working on new material or considering any guests you’d like to collaborate in the future? No new release is planned at the moment. For me it is not an obligation but rather than a way to get away from it all. So, if the right material and conditions allow it, I would release a new album. I am still writing music, it never stops. That’s all on my end! Please feel free to wrap this up in whatever way you like! Best of luck in your future endeavours!